The biggest game in the ACC all season is on Saturday night when the Clemson Tigers head down to Doak Campbell to take on the Florida State. In my opinion, both are the elite teams in the conference and whoever wins will have the inside track to get to Charlotte and the ACC Championship Game. The explosive Tigers offense and the physical 'Noles' defense. 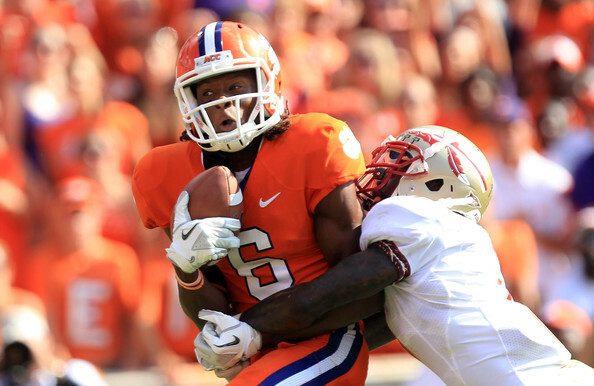 An improving Clemson defense and a balanced FSU attack. Who will come out on top? Here are my week four selections. The Cougars are coming off a tight loss to Utah and it is really hard to go up to Bronco Stadium and win. These Warhawks are damn pesky but can they either pull off an upset or come close again? I'm feeling more of the latter, since I really like this Baylor offense. The Cavs were a disaster last week against Georgia Tech while TCU struggled to put away Kansas. That Georgia Tech debacle was just too disconcerting, quite frankly. Wisconsin has been so disappointing this year, I do not have a huge amount of confidence that they could win this game comfortably at all. Do not have a lot of Faith (in Haith) in Mizzou. They were a mess against Georgia and came close to choking against Arizona State. If James Franklin is back, they'll have a chance but that is all. The Bruins better watch out, because I think this Beavers team is better than I had thought in pre-season. Temple is too sloppy and Penn State is coming off a great win against a bad Navy club. But why is this an ABC game? The Buffs are just an embarrassment to America. I will be in attendance at the Kibbie Dome, should be fun. The Trojans have been inconsistent that last two weeks but I have confidence they will get it together. I have not seen enough consistency from Auburn this season on offense to think they could move the rock against this fantastic LSU defense. Once I made the prediction of Oklahoma in the championship game I knew I would regret it. I am a believer in Collin Klein, I think he has made the strides necessary as a passer and I think the Wildcats will pull the upset in Norman. Pretty surprised that the Fighting Irish played as well as they did on defense Saturday night in East Lansing and I think they can do it again at home against the Wolverines. The key here is that Everett Golson has to play better this week. I thought about putting the Commodores in an upset here but I just do not think they have the horses the Bulldogs have. This game will decide the conference, in my opinion. I had the Tigers winning this game before the season and while I have been pleasantly surprised with Clemson's defense, I think the Noles are so good on defense, they can slow down Tajh Boyd and friends. Arizona is getting there but certainly do not have the speed yet that Oregon has. How about we cut Gary Bettman a little slack? Why is Colorado such a disaster?